This confusing explanation aside, the Real Madrid tablet is now up for grabs starting at €199, in three different designs. Unfortunately for Real Madrid fans who live elsewhere, its release is so far confined to Spain. 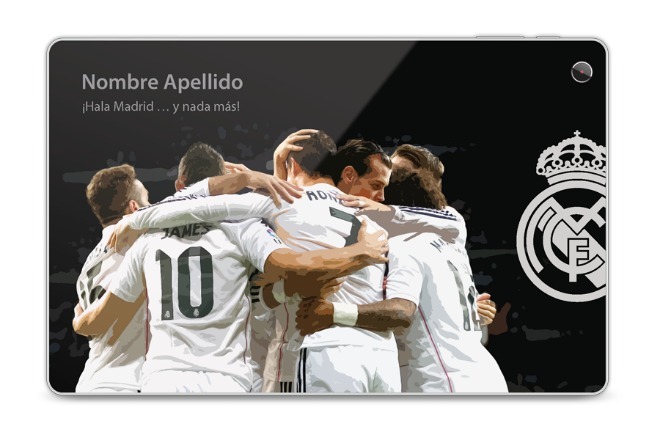 Aside from the Real Madrid branding, what sets this device apart from any competitors is that for a cool €50, you can have your name etched onto its back – in the image above, it would replace “Nombre Apellido” in the top left. The tablet runs Windows 8.1, and it has an 8.9-inch 1,920×1,200 IPS touchscreen, 2GB of RAM, 32GB of storage, a 5 MP rear camera, a 2 MP front-facing unit, and a 6,700 mAh battery. It’s powered by Intel’s Atom Z3735F quad-core processor that’s clocked at 1.33 GHz but can go as high as 1.83 GHz through Burst mode. Apparently you can look forward to Microsoft releasing a dedicated Real Madrid app for Windows soon, which you’ll obviously be able to install onto this tablet if you purchase it. Oh, and the first people to buy the device will receive free tickets to a tour of the Santiago Bernabeu stadium in Madrid.